Since our story was published, a number of Reg readers, including Giercyk himself and HRD's makers, have followed up with us regarding claims that this was not an isolated incident and others may have had their license keys blacklisted for being publicly critical of the company. And just to be clear: by blackballing keys, installed copies of the software stop working. The issue is not the refusal of service, the issue is that HRD disabled my software, and then offered to enable it in exchange for the removal of an online review of their product. It’s extortion, not refusal of service. I hate bullies, and that’s what I was dealing with at HRD, so I decided to stand my ground. I took a lot of lumps from people in the various forums at the beginning, but I also received encouraging emails almost immediately which gave me the courage to continue. I want to thank everyone around the world who supported me inside and outside the forums. El Reg has also heard from other hams who wanted to share their unpleasant experiences with HRD and a customer service problem they say goes well beyond the single rogue "contracted support employee" blamed by HRD for revoking Giercyk's license. One reader, Karel Cornelis, claims that his copy of HRD was blocked because he was thought to be a member of a Yahoo! group critical of HRD, and the license was only restored by co-owner Rick Ruhl after Cornelis proved he was not affiliated with the group. 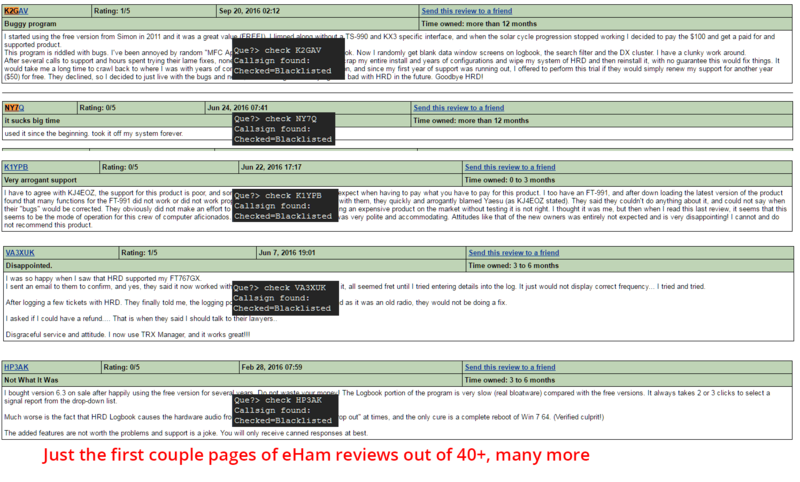 A number of other readers pointed out a collection of bad reviews posted on hobbyist site eHam by customers who had their license keys blacklisted. HRD told us some of those users could have written their assessments after requesting a refund and deactivating their software, thus their licenses will appear revoked. I downloaded their software to try with my radio as I am a newly licensed ham. The software wasn't connecting to my radio, and I had asked a question about it on their Facebook page. I found out that I needed to make my own cable in order for the radio to actually connect. I said something to the effect that I am glad that there is a trial because I would hate to spend all that money and find out it doesn’t work because the description of the support of my radio was not clear. They booted me from their Facebook page and even went so far as to block me so I can't even find their Facebook page. HRD is a good product, a little costly but if supported correctly, would be good value for money. However, the arrogant and abusive attitude of what I call 'level 2' support, the front line guys are fine, is where the problem lies. They desperately need to resolve this – taking money for support which, when needed, isn't forthcoming is a poor show – to then abuse the customer in their hour of need is disgraceful, but to have the stupidity to do it all in black and white email threads beggars belief. Everyone will assume that all these cases are retaliation. That's simply not true. Carper also rejected the suggestion that HRD is blocking customers based on the individual's callsign, maintaining that blocks are only based on registration keys. That claim has been challenged by Giercyk.